We hold expertise in offering a wide range of Yellow Oxide Powder. These are thermally stable and acclaimed for high efficiency and reliability. Demands of our products are increasing day by day owing to its accurate composition, finest quality and high efficiency. Owing to its clean shades and balanced pH value, these products are widely preferred by large numbers of clients. Yellow Iron Oxide pigment is a non bleeding pigment that is suitable for opaque or white melt and pour soaps and it is also stable in cold process soaps. Depending on how much you add, you can create various shades of yellow. We are fastest growing manufacturer and supplier of Yellow Oxide Powder in Udaipur, Rajasthan, India. This qualitative product is widely praised in domestic and international markets. This product can be purchased from us at industry leading price within the promised time-frame. our offered chemicals are cherished and acknowledged over the global platform. 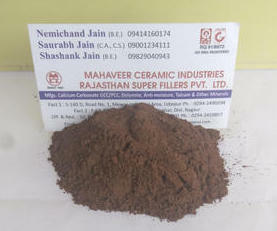 Rajasthan Super Fillers Private Limited, Rajasthan, India becomes an affluent manufacturer, exporter and supplier of Yellow Oxide Powder in Udaipur, Rajasthan, India. We are providing a premium quality range of Yellow Oxide Powder. We graded Yellow Oxide Powder by quality. We reblend the products according to specification, bagged and marked.